This Shelf Bracket Segmented Loop Hook Display is one creative way to display such right-angles wares on a Pegboard surface. And it certainly is unusual and eye-catching visually. I might suggest a more perfect alignment of the hooks, making it easier to visually judge the size of each Bracket offering. The slight erraticism here threw my eye off, but then I am known to suffer fro OCPD. That aside, this is interesting hookery and merchandising. 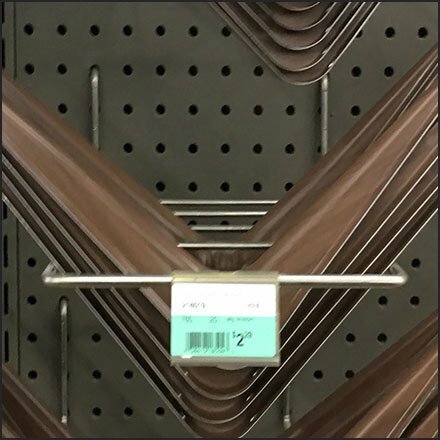 This Shelf Bracket Segmented Loop Hook Display seen a Conyngham Builders, Conyngham PA.